THE GREAT VILLAIN BLOGATHON 2017: The Mother of All Villains! 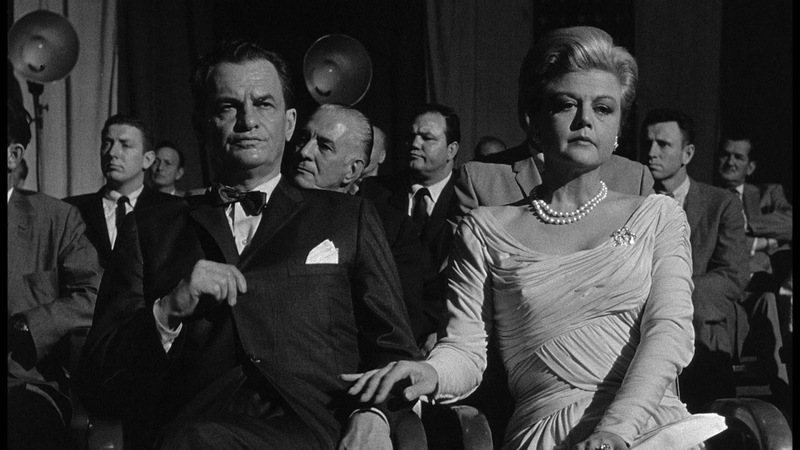 Malevolence is the key word whenever I conjure up the main villain in John Frankenheimer's masterpiece of political suspense, THE MANCHURIAN CANDIDATE (1962) starring Laurence Harvey, Frank Sinatra, Janet Leigh and Angela Lansbury. The film has a screenplay by George Axelrod based on the book by Richard Condon published in 1959. The subject matter was actually quite contemporary since the film was made only three years later. SPOILERS AHEAD, because I want to talk about the entire film. 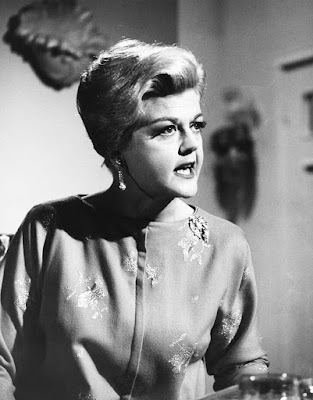 For me there can be no movie villain more malevolent than Angela Lansbury as the iron willed, cold as an iceberg mother willing to sacrifice a son's sanity for a political end. There is malevolence in the very 'normality' of her sophisticated appearance - Eleanor Shaw Iselin is the ultimate Washington D.C. political wife, help-mate and devoted mother of a Medal of Honor winner just back from Korea. At her doting husband's side, she is only too willing and able to lend a guiding hand. 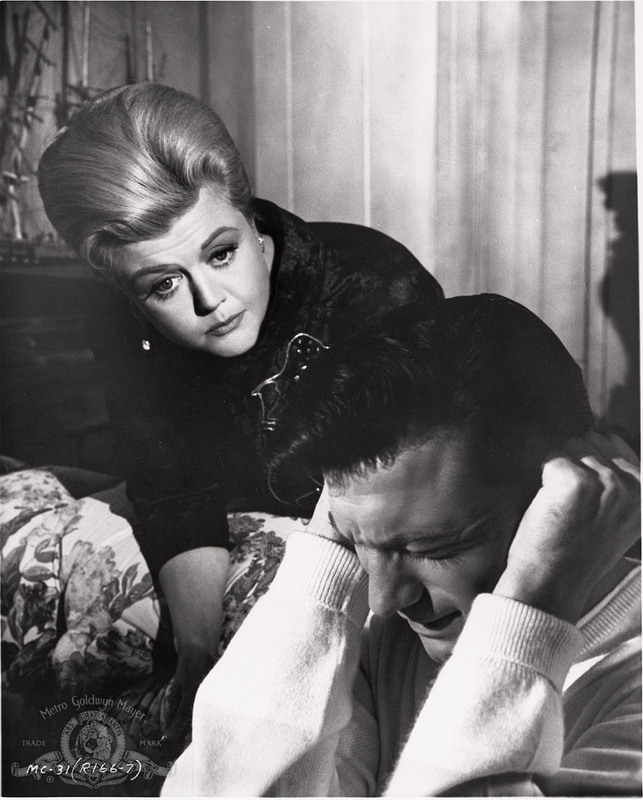 Senator Iselin has risen through the ranks guided by a brilliant wife who understands how to manage fools and does so with cold-hearted determination. This is an old story in Washington politics. Never more blatant than in this duplicitous marriage with only one end in sight: the presidency of the United States. 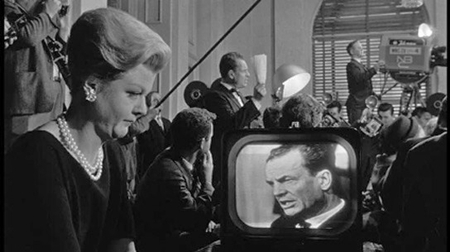 I've often thought how frustrating Mrs. Iselin's job must have been when it was SHE who really wanted the presidency for herself, she who wanted to wield ultimate power at a time when the presidency was exclusively a man's club. (Then and now, apparently.) How this barrier must have thwarted her at every turn while at the same time adding fuel to the fire of her ambitions. Brilliant, ambitious women (especially those without an ounce of empathy or sentiment) have never had an easy road. Most of the time they have had to sublimate their dreams in favor of whatever man was at hand as cover - especially in politics. Angela Lansbury plays Mrs. Iselin very much as a dedicated woman without remorse, one who is so twisted that she is devoid of any semblance of humanity. It is a chillingly brilliant performance. Especially for such a well-liked and likable actress. A patrol of soldiers is captured in Korea. They are brainwashed with new techniques (the 'garden party' scene alone is worth the price of admission) which work indecently well. Then, memories of the entire episode buried in their sub-conscious, the men are sent back to America with an amazing story of combat and the heroic exploits of Staff Sgt. 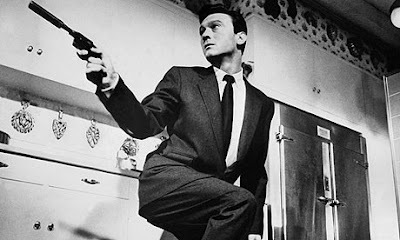 Raymond Shaw (Laurence Harvey) who will go on to be awarded the Medal of Honor for a non-existent event. Back home, when questioned, the men seem devoted to their leader, "Raymond Shaw is the kindest, bravest, warmest, most wonderful human being I have ever known in my life," they respond. In truth, because of his aloofness, he was the least liked man in the entire platoon. But Raymond Shaw is the son of Eleanor Shaw Iselin and the Senator's step-son and he has reasons for his perceived aloofness. He is an unwitting pawn in the all-encompassing political aspirations of a mother who has sold her soul to a political cause. Plus it doesn't help that Raymond hates her and his step-father. As played by Laurence Harvey, a normally cool and uninvolved sort of actor, Raymond comes across as stiff, awkward, lonely and isolated. It is Harvey's best performance - his normally stand-offish persona working very well here. 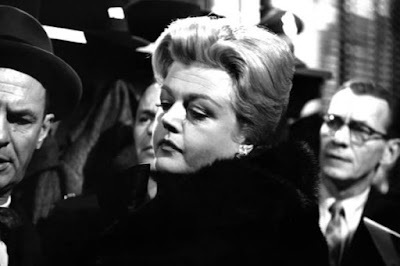 In reality Angela Lansbury was only three years older than Harvey, which makes her Oscar nominated performance even more impressive. Shaw and his fool of a step-father are merely stepping stones for Eleanor Iselin who is a deeply embedded Communist agent now well on her way to achieving the goal of getting her husband into the Oval Office by hook or by crook. To that end she plans to have him swept up by manufactured nationalistic frenzy (remind you of anything?) when later, by her command, the actual presidential candidate is scheduled to be assassinated at the convention and her 'grief-stricken' hubby will then give an emotional 'America first' speech while holding the dead body of his 'friend.' The speech is meant to catapult Iselin to the top of the ticket. It is a powerful speech worked on as she says, "here and in Russia on and off for eight years." 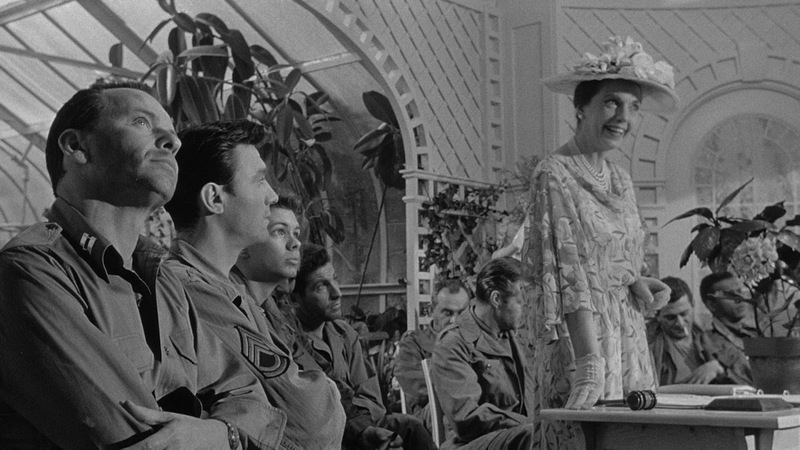 To that ignoble end, Mrs. Iselin is willing to compromise and destroy her own son. A son, whom, by the way, she has ensnared in an incestuous relationship. He is the assassin set up by the communists - having been brain washed in Korea (unemotionally killing two of his fellow soldiers in the process) to carry out the death of the presidential candidate. Raymond's state-side handler is none other than his own mother. His 'trigger' is the Queen of Diamonds in a deck of playing cards. Once he is shown the card, Raymond will blankly carry out any order he is given. Marco and his psychiatrist (played by Joe Adams in an uncredited part) work out how the cards might be involved in his nightmares. Frank Sinatra's troubled character in the film is another mind-altered member of the original platoon. Major Bennett Marco, re-assigned to Army Intelligence state-side, has been having vivid nightmares about his experience in Korea. When he learns that a fellow veteran, Corporal Allen Melvin (James Edwards) has also been having similar dreams, they begin to put two and two together. Marco comes in contact with Raymond Shaw and little by little he begins to realize that the story they 'remember' about Korea may not have actually happened. In the end, it will be up to Marco to try and stop Raymond Shaw from carrying out his imbedded instructions. 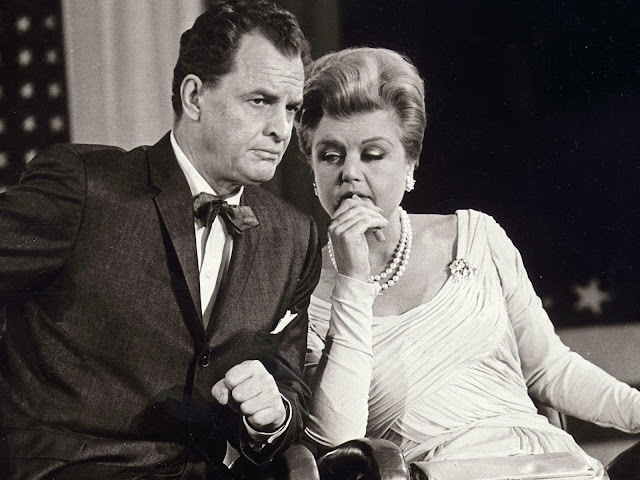 In the meantime, Eleanor Iselin learns that Raymond has taken up with an old girlfriend, Jocelyn Jordan (Leslie Parrish), daughter of Senator Thomas Jordan played wonderfully by John McGiver. The warmth of that father daughter relationship comes as a temporary balm to Raymond's inchoate coldness. He, at last, might have found a bit of happiness. At first, Mrs. Iselin approves of the relationship since she wants the influential Senator Jordan's public approval of her hubby's Vice Presidential bid. 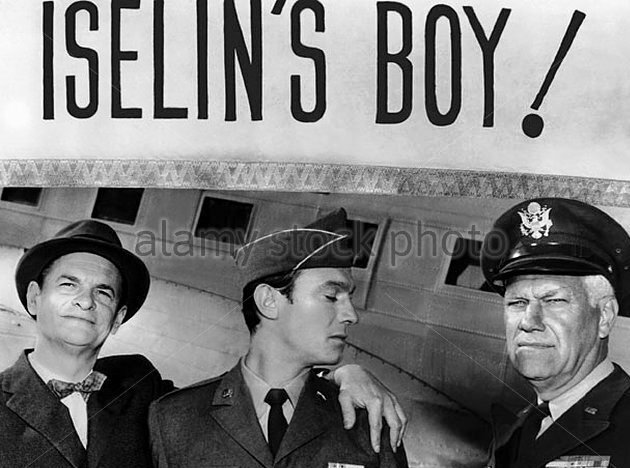 But when the Liberal Senator makes it very plain that he will, under no circumstances, approve Senator Shaw, Mrs. Iselin instigates one of the cruelest and more heart-rending events in the film. 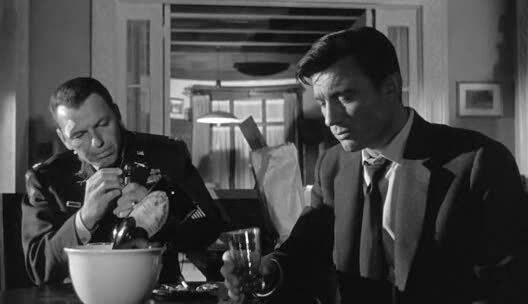 And the way that director John Frankenheimer develops the infamous 'carton of milk' scene makes for one of the most devastating moments in film history. 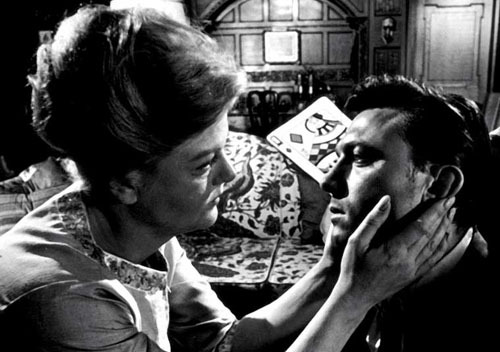 Mrs. Shaw shows Raymond the Queen of Diamonds card and orders him to kill Senator Jordan. When Raymond, an automaton without any will, goes to the Senator's townhouse and confronts him in his cozy kitchen, he not only shoots down the Senator in cold blood but as Jocelyn Jordan accidentally enters the scene, Raymond kills her as well. Later he is utterly heartbroken to learn the news of his friends' deaths since he has no clue it was he that caused it. Near the end Marco finally breaks the hold the communists have on Raymond's mind and believes he's stopped whatever it is that Shaw is supposed to do. But later, in one of the most creepily powerful scenes in the film, Mrs. Iselin, unaware of Marco's interference, goes ahead with her instructions to Raymond, topped off with a very un-motherly kiss. Later, Raymond shows up at the political convention in disguise and calmly goes up to a room from where he can survey the entire stage. A desperate Marco races to find and stop him. As Raymond sets up his rifle, he is cool, collected, and completely in charge. Has Marco failed? Will Raymond's brain washing re-assert itself? 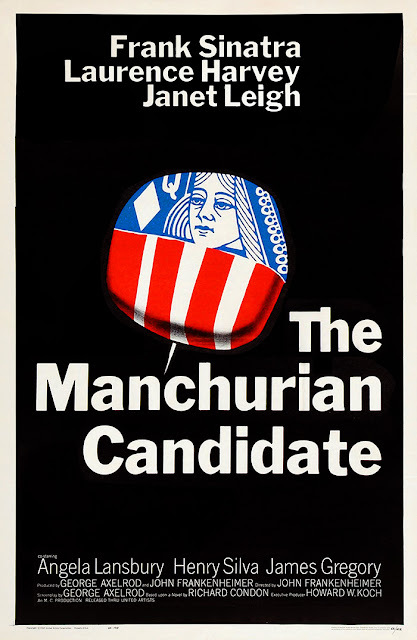 Will he kill the presidential candidate and catapult his odious mother and step-father into the White House? In one of the best endings to any film I've ever seen, Senator Shaw and Raymond's mother sit side by side near the podium, awaiting what must happen - the next step towards the fruition of their dreams. Suddenly a shot rings out and Shaw rears back, shot in the head. As he slides to the floor, his frightened wife looks up towards the room where she knows Raymond is hiding and she too is shot. As the cops and Marco break in the door upstairs, Raymond Shaw kills himself. Marco finds the medal of honor affixed to Raymond's jacket. What a film. John Frankenheimer's gritty direction is excellent as is the editing which adds another element to the tautness of Axelrod's script. The acting, needless to say is superb. THE MANCHURIAN CANDIDATE remains an especially relevant story, especially now, considering today's political climate. 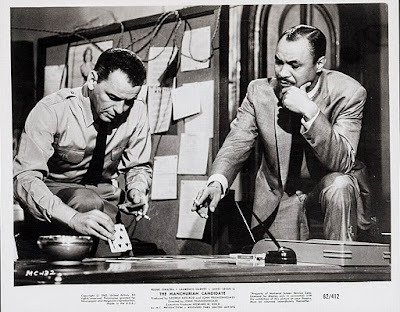 "According to rumor, Sinatra removed the film from distribution after the John F. Kennedy assassination on November 22, 1963. Michael Schlesinger, who was responsible for the film's 1988 reissue by MGM/UA denies the rumor. 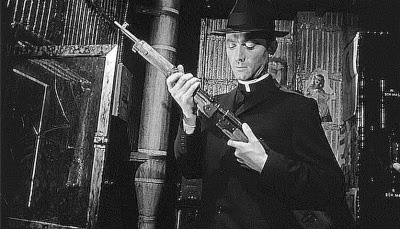 According to him, the film's apparent withdrawal was not due to the assassination, but by 1963 the movie had simply played out (in those days it could take a film months to play across the country). 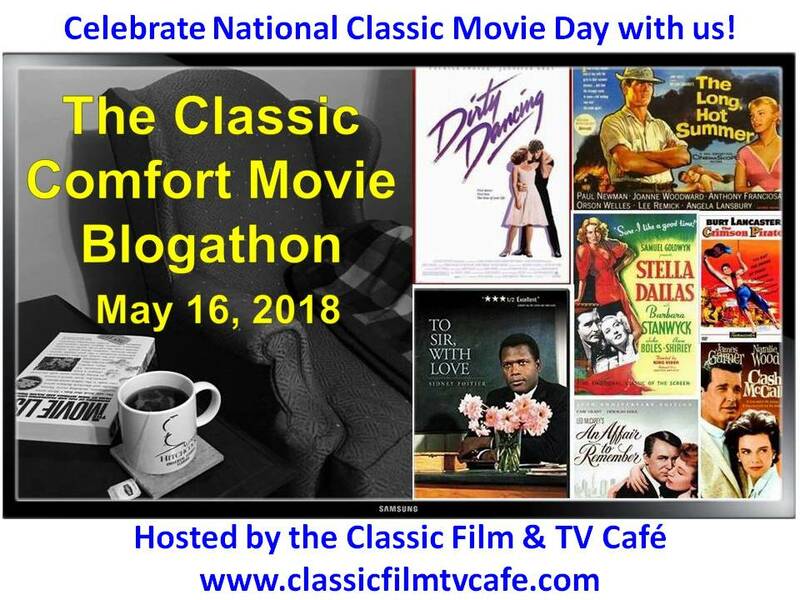 The film became the premiere offering of The CBS Thursday Night Movie on the evening of September 16th, 1965, and was rerun in April 1974 on NBC Saturday Night at the Movies. 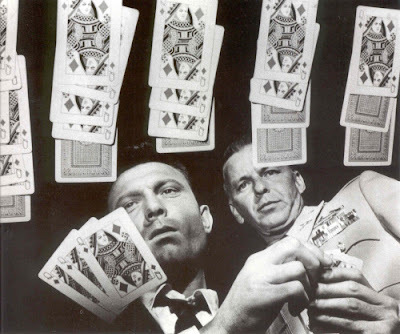 Sinatra's representatives reacquired the rights in 1971 after the initial ten-year contract with United Artists expired. After two successful showings at the New York Film Festival in 1987 renewed public interest in the film, the studio reacquired the rights and it became again available for theater and video releases." Wikipedia. 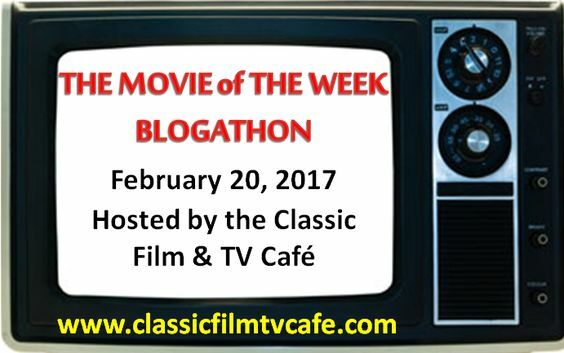 My post today is part of the THE GREAT VILLAIN BLOGATHON 2017. 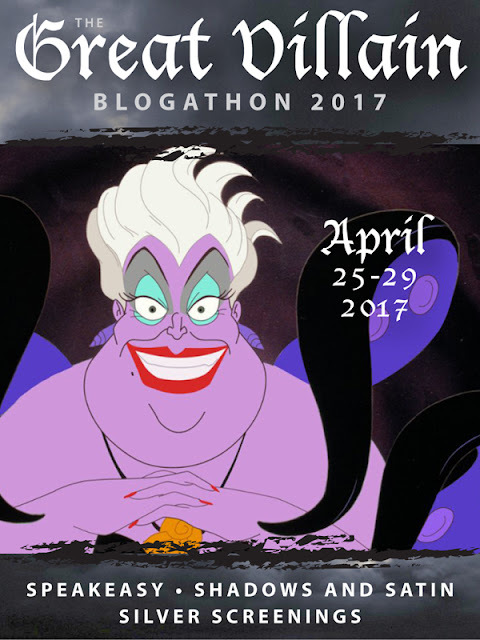 Lots and lots of fabulous bloggers will be writing about their own favorite Movie Villains, so don't forget to check out their posts. Your Hosts for THE GREAT VILLAIN BLOGATHON 2017: Ruth of Silver Screenings, Karen of Shadows & Satin and Kristina of Speakeasy. Link here for complete list of contributors over the next three days. I owe thanks to TomCat over at Beneath the Stains of Time for recommending John Russell Fearn, a writer I'd never heard of much less read. But I was intrigued enough by TomCat's review of a different Fearn so that my next stop was Abe Books online - my home away from home when it comes to vintage. Actually, several Fearns are now available as e-books too. But I will try for an actual book if I can find it first and lo and behold, I found one I could afford and it arrived a couple of days ago. And before I hardly knew what was what, I'd sat down and read the whole thing. Don't you love when that happens? 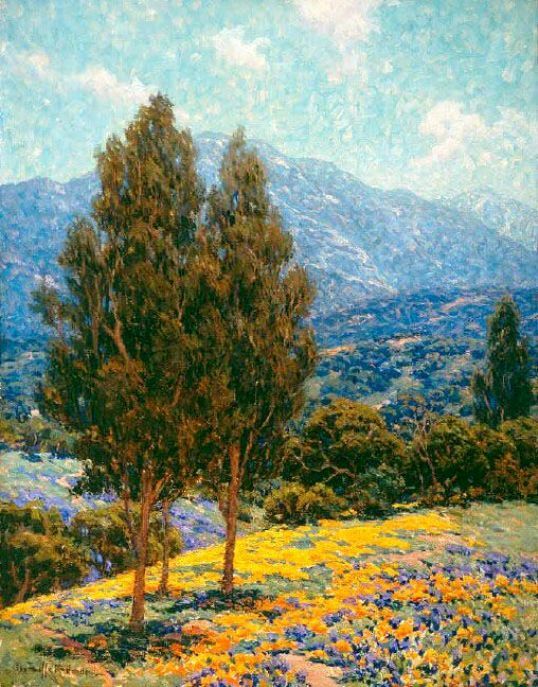 Ultra prolific English author John Russell Fearn published under MANY pseudonyms, more than we have time for here. (I can only imagine that he wrote 24/7 with only brief time-outs for food and drink.) I can't find an original publication date for THE MAN WHO WAS NOT, so I'm assuming late forties or mid-fifties since Fearn passed away in 1960. At any rate, I enjoyed this book so much so that I read it at one fell swoop when I had originally meant to read just a few pages to note the style and then move on to another book I was in the process of finishing. 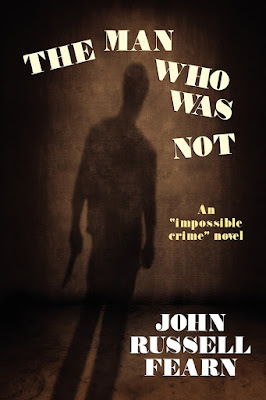 THE MAN WHO WAS NOT is, I suppose, an impossible crime mystery but in truth, that sort of thing doesn't matter much to me one way or another. I'm not so much interested in 'category' as I am in reading a good, fast-paced, well-done whodunit with enough mystery to keep me guessing. 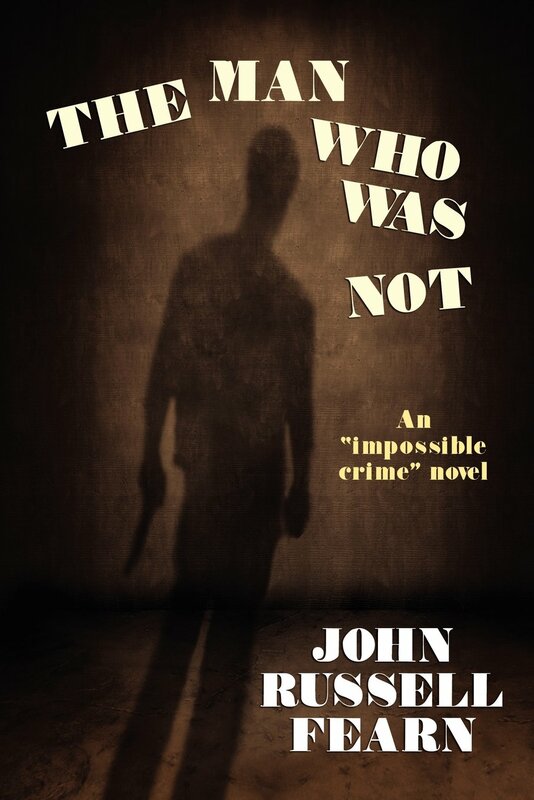 This book has that and more - the murders themselves (and there are more than one) are carried out in preposterous fashion - the sort of thing that would never work in 'real' life - but here they work because 'why not?' - these were the sorts of crimes inventive writers were creating back in the day and when I read a book like this, I suspend my disbelief willingly. This is nothing more (or less) than a break-neck whodunit in which motive doesn't matter as much as the shear improbable idea of a murderer going through all these machinations simply to do in a whole family. Need I say, I didn't mind the outrageousness of it at all. For me, that's part of the 'fun'. One by one, members of the Dawson family are being eliminated. First the n'er do well son dies in a supposed road accident. Coroner satisfied. Police uninterested. But when one of the Dawson daughters receives a threatening phone call warning her she will die at a certain time, she goes to Scotland Yard. They assign some men to guard her (I didn't know the police actually did this, but apparently they do if the father in the family is a renowned somebody - in this case, a surgeon.) But despite the guards, Trudy Dawson, newly affianced and seemingly without an enemy in the world, dies. Scotland Yard takes a second look at her brother's death out on the highway and discovers that he too had received a warning phone call. By the time the third warning message is delivered to another member of the Dawson family, Scotland Yard is more baffled than ever. The phone booth from which the phone calls were delivered had been under surveillance and NO ONE was seen to enter the booth and instigate the call. Soon Sawley Garson, 'specialist in scientific puzzles' is called in to help the Yard. There is little character development here since this is certainly not a character driven book unless we count the strange character of the killer who constructs this whole farrago of murderous complications to suit himself. A lot of what happens in this book is mumbo jumbo science - or at least, so it seems to me. But because of the author's crafty ways, the thing just works. I just sat there and read away, enthralled by the whole thing, wanting to know 'what next' and even when we begin to suspect who the killer is, it still kept my interest until the very last page. A terrific book, I'd say, for an afternoon or evening of reading in a comfy chair or poolside or at the beach. No brain stretch but still intriguing enough to capture the imagination. Sometimes you find yourself caught up in a book for no other reason than the story carries you along helter skelter and before you know it, reality has slipped away. I'm so happy I discovered John Russell Fearn (with TomCat's help) and I'm looking forward to getting my hands on more of his mysteries. Since this is Friday once again, don't forget to check in at author and Edgar Award nominee Patricia Abbott's blog, Pattinase, to see what other forgotten or overlooked books other bloggers are talking about today. It is difficult to review a book that is part of an on-going series featuring characters I've grown to know and have a great deal of affection for. The difficulty is this: How much do I tell about these characters and their present situation which has been slowly built up (by the author) over the previous six books? 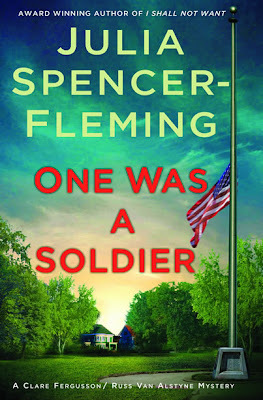 ONE WAS A SOLDIER is the seventh entry in a series which, in its debut book won just about every literary prize available. It is in many respects, a brilliant series because it manages what many of these sorts of books do not: it sustains the on-going tension, suspense and interest on a high level from book to book. The series is set in a small upstate New York town in the Adirondacks, the fictional Miller's Kill, where it always seems to be cold, snowy, windy and damp. Needless to say, the weather adds enormously to the atmosphere of the stories. The two main protagonists of ONE WAS A SOLDIER are the pragmatic Desert Storm vet and Chief of Police, Russ Van Alstyne and the Episcopalian priest Clare Fergusson. She is an enigmatic, no-nonsense helicopter pilot, vet of the Iraqi war and a current Major in the National Guard. As far as the citizens and church-goers of Miller's Kill are concerned, Clare was a curiosity from the first. And in many ways it isn't until recently that she appears to have found firmer footing within the town; many of whose inhabitants are themselves veterans or families of veterans. As the series begins (IN THE BLEAK MIDWINTER 2002), Chief Van Alstyne is happily married to Linda, a woman about whom we learn a bit more as the books progress though early on she remains offstage. She is self-employed making drapery and curtains to order for local businesses. But there is an immediate attraction between Clare and Russ, as she, the newly appointed priest of St. Albans, arrives in town in the middle of winter in her her totally impractical red sports car. She is as different from Russ's petitely beautiful little wife as night to day. Clare is tall, physically imposing and a woman used to doing for herself after years as an Armed Forces helicopter pilot. The reader and the characters know that this unwelcome attraction can never be acted upon. There is nowhere the attraction can go and so in this first book, Clare herself distances herself from the Chief of Police. Russ and Clare are realistically drawn honorable people and their attraction must necessarily remain in the background, lurking about but not allowed to take over. It is in the tension generated by this attraction that the books' foundation lies. I wait to know what's going to happen, year to year, book to book, as the attraction deepens and the story of these two troubled souls progresses. So I don't want to reveal too much about what has led to the present status of events, though if you read this book first, you'll figure it out immediately and then, I assume, want to go back and begin at the beginning. That's happened to me before with a series - it's not the end of the world. It's occasionally helps in certain series to know what's happened before to the two main characters. I don't mind this when the characters are written strong and capture my undivided attention. ONE WAS A SOLDIER is centered primarily on the rough times that veterans - Clare included - often have upon their return to civilian life. When Clare comes home from her recent tour of duty flying combat helicopters - she's been gone a year and a half as the book begins - she is beset with post traumatic stress and turns to her leftover stash of pills brought back from Iraq, downed usually with alcohol. Clare, despite her calling, is not immune to the pressures brought about by disturbing memories of war. Feeling herself losing control, Clare joins four other veterans in a support group. We get to meet those survivors, each with their own individual and very moving problems. When one of the group dies, Chief of Police Russ Van Alstyne is convinced it's a suicide. But Clare and the other vets are not so sure and decide to conduct their own investigation. What they eventually discover may link events in Baghdad with the town's wealthy real estate impresario and chief employer, a vile man who is also Clare and Russ's nemesis from a previous book. I won't say too much more about the actual story only because, as I said, I don't want to spoil it for those of you who haven't read it yet and are not familiar with what's been happening to Clare and Russ in Miller's Kill, New York. Author Julia Spencer-Fleming reveals the story from several viewpoints and moves a secondary romantic entanglement to the front burner, woven in with the stories of the returned vets. My only problem with this technique is that I've never been fond of varying viewpoints. But I like these books so much, I will tolerate it from this author. I'm also not liking the woman cop involved in the secondary romance - she just isn't a very likable person - the author needs to take care of this in the next book, I think. Unless she's going someplace else with this story line. In general, Spencer-Fleming gets to the nitty-gritty of what makes these complex characters tick. These people 'live' in the imagination from one book to the next. You leave them each time, mystery solved, but feeling: okay, what's going to happen next? My opinion is that this is one of the best series out there and you're really missing something special if you're not reading it. But - as I said earlier, BEGIN AT THE BEGINNING. Though if you don't, the world won't come to an end. Look, just read these books any which way you like, they are damn good. Julia's Fantastic Fiction page listing all the books in the series. Since it's Friday, don't forget to check in at Edgar Award nominated author Patricia Abbott at her blog, Pattinase, to see what other forgotten or overlooked books other bloggers are talking about today. I didn't actually promise I wouldn't write another review of an Innes book ever again, so here we are. As most of you know I am a MAJOR Michael Innes fan so I can't reasonably be expected to stay mum about one of my favorite authors for long. I've written enthusiastically about his books over the past eight years of my blogging existence, so if you're interested, just use the search thing at the bottom of the page. It's finally working again. HARE SITTING UP reads like a story in which Innes (pseudonym for John Innes MacIntosh Stewart - 1906 - 1994) was having fun seeing how far he could go with a 'thriller mystery' without actually killing anyone off. In fact, near the end when a killing does occur, it's not a very prepossessing one or for that matter, of much real importance. What is most fun about this book - at least for me - is the journey. 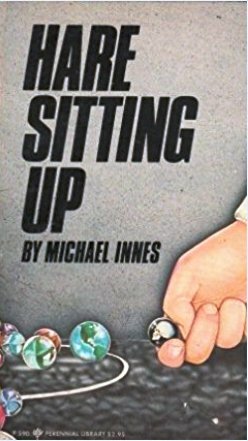 That is often the case with several of Michael Innes' books - my favorites, in fact. "I'm much more interested," Gavin said at once, 'in something else. It's the twilight of the gods idea - the fascination of bringing everything else down with you as you fall. Hitler was gripped by that, I imagine. But you needn't necessarily be a Wagnerite to feel the tug of it." Alice crossed a green leg over a yellow one. "Death-wish stuff," she said. "How does it correlate with actually dying? Does anybody know? You see, we've talking about the dangers of concentrating power - and far more potential destructive power than has ever existed before - in the hands of old, sick men..."
And on it goes, in Innes, we have discussions of this sort which might mean something as we go along but then again, might not. In HARE SITTING UP, the discussion is just to put us in a frame of mind for the pile of absurdities which come next. The train passengers themselves - except for two - will not show up again in the story. As for the twin thing, well here we have two brothers: Miles Juniper and Howard Juniper - one is a scientist, a germ warfare expert (uh-oh) and the other is a public ('public' in the English sense) school headmaster. And remembering how much Michael Innes loves the preposterous, he has one of the men disappear - but which one? He also has Chief Superintendent Appleby show up at the school in disguise to interview the brother - just in case spies should be lurking - that sort of thing. Some people (with little or no imagination) do not like Michael Innes' sense of absurdity and his oft indulged propensity for outrageous plots and odd humors. But I'm not one of those people. In many ways, I sometimes think that Innes was one of the early proponents of 'magical realism' except we didn't call it that back in the day. His use of coincidence and Appleby's nearly clairvoyant knack for putting two and two together with various leaps of intuitive logic, are legendary. The plot of HARE SITTING UP is a tangled one as Appleby goes off on wild goose chases and even recruits his wife (improbably he's done this a couple of times before) to check out a school once he realizes that something might be amiss there. She jumps right into the thing by improvising a wild game (Judith Appleby comes from a long line of eccentrics, see APPLEBY'S END for the definite proof) in which she and several students run all over the campus looking for clues of something or other. In the meantime, Appleby confronts a wacky member of the aristocracy, a reclusive ornithologist living at a remote estate with a whole profusion of birds and ducks who amble in and out of the house at will. Also in residence, a granddaughter to keep an eye on him. Eventually, Appleby begins to get the hang of the thing and shows up at a secret, rainswept government installation on a remote Scottish island. The atmospherics here are particularly effective. From there, it's back to the birds and the loony lord who may or may not be plotting a crazed something. It's all improbable and not meant (despite the subject matter) to be taken too seriously. As I mentioned, it's the journey that I enjoy most with Innes and the often obtuse use of language and literary allusions - the knack for which is unlike any other genre writer. Yes, he was often pulling our leg or even, perhaps, making sneery faces, but I always got the idea that he was doing it in a very indulgent way - like an uncle who knows he's smarter and wittier and more literary than anyone else, but manages somehow not to make you resent him. Yeah, I guess you can call me a Michael Innes fan-girl. Since this is Friday, don't forget to check in at Edgar Award nominated author Patricia Abbott's blog, Pattinase, to see what other forgotten or overlooked books other writers are talking about today.